Keep your modern furnishings in white and use vintage textiles or an antique carpet to drop in a punch of color. The carpet or textile will be the star in a monochromatic backdrop, creating a dramatic accent in what could be an otherwise bland design. The lines of modern furniture can often be lean and spare. Anchoring the room with an antique Persian carpet is just the antidote. The rug will add texture and pattern, while infusing a seating area with warmth and rich color. Mixing modern and traditional designs can be tricky to pull off. To successfully combine them, strive to contrast shapes and colors: hard plastic surfaces with the lush texture of antique carpets, round shapes common in modern furniture juxtaposed with the square of an antique area rug, a palette of white interrupted with the rich hues of a Persian rug. The recipe is to create a melange, balancing one design style with the other. Vintage textiles go with everything. You can drape them over mid-century modern-style chairs and couches, create big pillows for the floor and sofa, or employ them as a covering for coffee and dining tables. The great advantage of using textiles is that they are both versatile and portable, and add timeless taste to any dwelling. You can move them from room to room to change a look in an instant. Plus, vintage textiles are more affordable than rugs and carpets, while still being a great investment that will last a lifetime. Try running a modern carpet pattern, such as a zebra motif, as a runner down the stairs, while laying an antique Oriental runner in an adjacent hallway. Tie the whole thing together with a wall color that echoes both rugs. The combination is surprisingly compatible and stylish, mainly because antique rugs, with their many colors and patterns, go with everything. The primary benefit of adding an antique rug to a modern home is that it breaks up the potential monotony of modern decor. One of the biggest design mistakes found in decorating a home is having too much of one type of decor. This doesn’t allow for the contrast of opposites that makes for great design. An antique rug or vintage textile piece can be just the eclectic piece that brings character and distinction to a room. While a large antique rug can make a big design statement in a living area, you can also use smaller area rugs to bring warmth to a modern bathroom with a stone floor or a foyer that is furnished with mid-century modern pieces. Even a small antique rug will add a colorful and tasteful element to what might otherwise be a cold room. Often in a modern home, the color in the design is brought in by the art and the rug. Think of the art as decorating the walls, while the rug is art for the floor. This can be particularly dramatic in a white or ivory monochromatic room, where the antique rugs and modern artwork are the accents that warm up the room and entertain the eye. Modern furnishings and design often has a casual look that can be offset by the more formal look of a traditional antique Persian carpet. When this balance of casual and formal strikes just the right note, it makes for a stylish combination – one that can be accomplished in any room, from the living and family rooms to the kitchen and bedrooms. 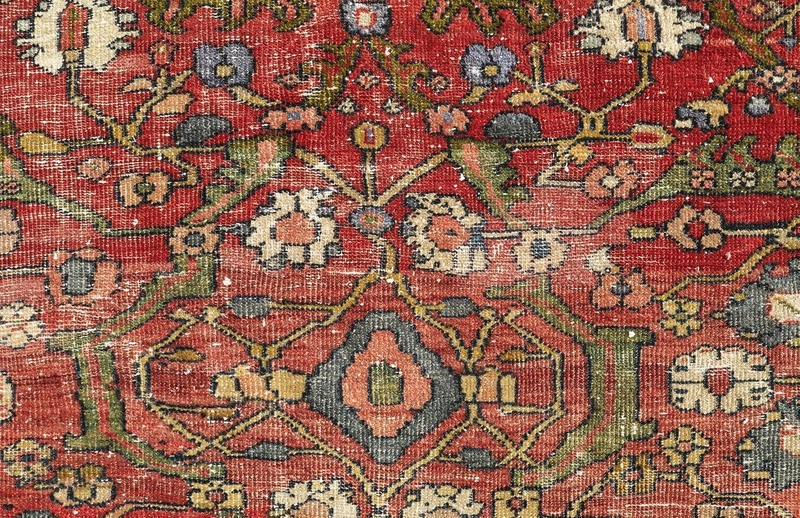 Not all antique rugs are in the traditional reds. If you prefer the monochromatic color scheme that is prevalent in mid-century modern style, you may want to opt for a neutrally colored antique rug as well. The vast selection of antique rugs in neutral tones will surprise you, and will allow you to continue the calm, neutral tone you’ve set while adding warmth and visual and tactile interest. Cover up a less-than-perfect floor by putting multiple rugs in various sizes in the same room. Layering rugs over one another and at different angles adds depth to a modern room. And the advantage of antique rugs is that they coordinate with one another, so you don’t have to agonize over the selection. There is a common misconception that it’s necessary to choose a design style and stick with it. By dispensing with the myth of modern vs. vintage, you will be taking a step into better decor. Modern needs vintage to warm it up, and vintage needs modern to, well, make it modern. A home decor that successfully integrates these two styles creates a space that is infinitely more livable.